Rural Revolution: Our wheat is growing! 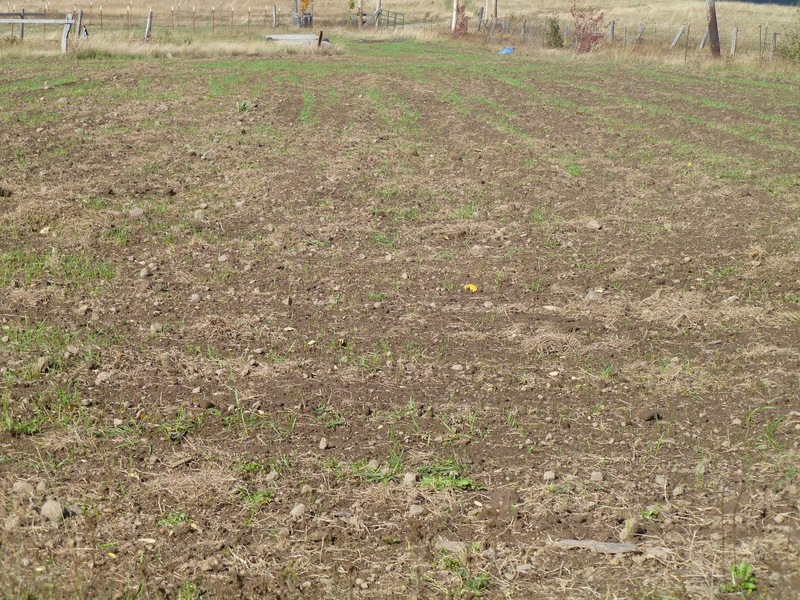 If you remember, we sowed our wheat about a month ago. 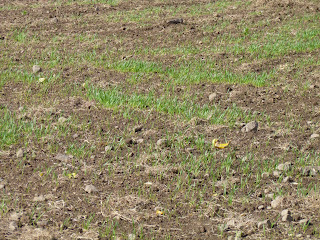 The weather was fine for sowing: dry ground, then some rain, followed by warm sunshine, more rain, etc. 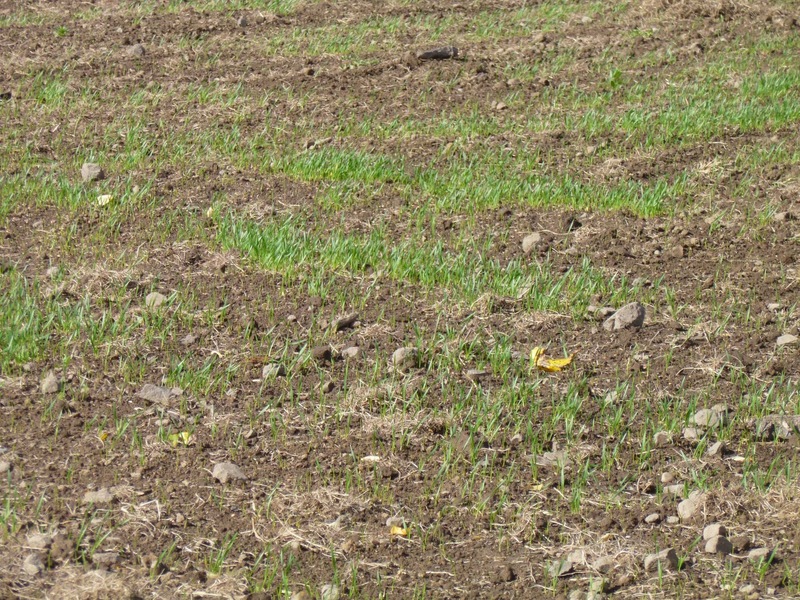 Now that the weather is turning nasty, the wheat should go dormant over the winter and begin to grow more vigorously next spring. In retrospect, we realize we made one error in sowing the wheat. Just before we all walked abreast in the field and flung the seed on the ground, Don made one final pass with the chain-drag-thingy we borrowed from a neighbor. This made the field beautifully smooth, but it also meant the seed landed on top the ground rather than in furrows and cracks. Had we left the field disked but not smoothed - and then smoothed it after planting, thus burying the seed - our sprouting rate might have been higher. Ah well, live and learn. It's just in our nature to want to smooth things over just one more time, right? But you still have some wheat growing so good for you! Even better for you, a lesson was learned that will serve you well with all your future crops of wheat. It's all good!! It is looking good. Can't wait to see what it looks in the spring. I think it looks great! I like that you're testing this out first so that we can learn from your mistakes when we finally get around to planting wheat! Makes me long to get out of the apartment. I bake bread already, my next step is to buy a grinder and a bucket of wheat berries and got from scratch that way. I really appreciate the sharing of this info. Heh. Yeah, that chain drag thingy is for after you plant! 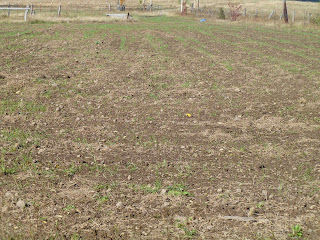 It is time for us to plant the winter ryegrass, but it is too dry (in this, our rainy season). Gonna be lots of wildfires! Dang it Patrice and Don. This is such an old life lesson that I am suprised that it never occurred to to you. Appearance..is everything nowadays. Problem is that is wrong. Looks start off well but a life cycle has a way pooping on looks. I hope you still reap a great harvest. The price of wheat is pretty good! chalk up everything to a learning experience-the field looks good anyway and hopefully next year you will have a good crop of wheat...and the year after will be even better.